The Promised Messiah (on whom be peace) said our Jama’at should not limited themselves to discussions and debates as they are not the real objective. He said purification of the self and reformation are essential and were the purposes for which God had sent him. He wanted practices of the Jama’at to change. By saying not to limit ourselves to discussions and debates he meant not to confine ourselves to words and perhaps change our stance to suit ourselves and not able to uphold good moral standards. He wanted us to make purification of self a constant part of our lives in order to fulfil the dues of Bai’at. Ahmadis should remember that in order to fulfil dues of Bai’at we have to keep God’s commandments in view and put them in practice. We should ever be mindful to have God’s pleasure in view. It was explained in last Friday sermon that to experience acceptance of prayer the commandment of: ‘…So they should hearken to Me…’(2:187) should be practiced with all of one’s capabilities and spend one’s life in accordance to God’s commandments. We should self-reflect in the special spiritual atmosphere of Ramadan to see as to how much do we make God’s commandments part of our lives otherwise ours will be mere verbal assertion that we abide by His commandments. The Holy Qur’an has numerous commandments which should be constantly kept in view so that we can be mindful to reform ourselves. Today some of these commandments were extolled in the Friday sermon which play part in purification of self as well as creating love and peace in society. God states in the Qur’an: ‘And the servants of the Gracious God are those who walk on the earth in a dignified manner, and when the ignorant address them, they say, ‘Peace!’ (25:64) That is, they do not walk arrogantly, rather they walk in a gentle manner. The verse briefly outlines the great moral and spiritual revolutionary change brought about by the Holy Prophet (peace and blessings of Allah be on him) which his Companions adopted. It was a time when the world was steeped in moral darkness and satanic influence was dominant. The world was in turmoil due to egotism, selfishness and evil. This was when man was taught high morals and humility which resulted in people becoming personifications of the aforementioned verse. Today the world situation is similar and by sending the true and ardent devotee of the Holy Prophet, the Promised Messiah, God has willed to have similar servants of Gracious God created. For this reason we need to keep in view walking with dignity, gentleness and humility and devoid of any arrogance. True servants of the Gracious God need to be mindful of this. Such people spread love and become guarantors of peace in society. They respond to incitements of the ignorant with greetings and rather than reply in kind they pray for security and peace of the ignorant. To respond in this manner when one is in power and authority for the sake of Gracious God, is a very high moral which makes man a true servant of God. People who follow this also experience acceptance of prayers and are the kind of folk about whom the Promised Messiah (on whom be peace) said that they purify themselves, seek God’s kingdom and establish God’s kingdom on earth. Ramadan has the glad-tidings of doors of Paradise being wide open during it and doors of Hell closed and God coming closer to man. God is indeed close to man at all times, the significance here is that He enhances rewards of good works during Ramadan. Every Ahmadi, who is a true Muslim, who has taken Bai’at of the Promised Messiah (on whom be peace) to become servant of the Gracious God, needs to give up arrogance and conceit, end estrangements, bring about reconciliation and spread peace with humbleness at home and in society. The Holy Prophet (peace and blessings of Allah be on him) taught us to adopt humility to such a degree that none should be proud of anything. There is no external way to gauge this and each person who claims to have faith needs to self-reflect and see if he is free from all pride; pride of lineage, pride of wealth, pride of highly educated offspring, pride of one’s academic prowess etc. The Holy Prophet (peace and blessings of Allah be on him) said that no Arab is superior to a non-Arab and no non-Arab is superior to an Arab. The main aspect is righteousness and one who is righteous will not harbour any form of pride. At times one can be so proud of one’s academic prowess that one becomes distant from faith. When God commanded the Holy Prophet (peace and blessings of Allah be on him) to announce: I am the chief of all mankind, he added, I have no pride in this regard. This was his level of humility after attaining the lofty station which no other can reach. Such was his desire to keep peace and brotherhood of man that when a Jew said he had been hurt because when he tried to prove the excellence of Hazrat Musa (on whom be peace) to a Muslim, the Muslim responded harshly saying the status of the Holy Prophet (peace and blessings of Allah be on him) was higher, the Holy Prophet (peace and blessings of Allah be on him) said: do not give me preference over Musa. 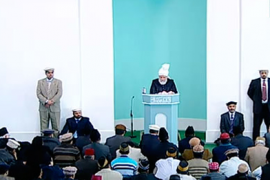 This is the blessed model to maintain peace in society and is an answer to those who make negative allegations against the Holy Prophet and is also an answer for those who carry out barbaric cruelty in his name. We who have accepted the Promised Messiah (on whom be peace) are duty-bound to refute the allegations against his blessed person. For this we have to become embodiments of the true teachings of the one whom we claim to accept. Indeed, the Holy Prophet (peace and blessings of Allah be on him) said ‘God says whoever adopts humility for My sake this much’, and he lowered the palm of his hand until it touched the ground, ‘I will raise him this high’ and he lifted the palm of his hand very high. God grants unimaginable loftiness to those who adopt humility for His sake, abhor arrogance for His sake and try and uproot hatred from society for His sake in order to create peace and security. We need to self-reflect during Ramadan and end family disputes for the sake of God and create an environment of peace. Disputes among brothers are usually caused by egotistical reasons and should be ended and prayers should be made for our opponents so that disorder and chaos in the world ends. We talk a lot about peace but it comes to the crunch when we are also embroiled in disputes and end them for the sake of God. The Promised Messiah (on whom be peace) also said that man is a humble being but owing to bad practices considers himself high and mighty and develops arrogance and haughtiness. In the way of God, man cannot get anywhere unless he considers himself the lowliest of all. The Promised Messiah (on whom be peace) gave the example of Kabir [15th century Indian mystic poet] who wrote that he was happy to be born in a humble home and was deferential to everyone. Adding, had he been born to gentry he would not have found God. The Promised Messiah (on whom be peace) said man should always be mindful of his lowliness. No matter how aristocratic a person is, when he reflects over himself, he will certainly find that from some aspect or the other he is most incompetent and lowly in the entire universe. He also said that unless man extends the same courtesy to a poor and helpless old woman that he extends to a man of high nobility and does not shun every kind of arrogance and conceit he can never enter the kingdom of God. We should spend these days in Ramadan available to us to bring about pure changes and gain acceptance to prayers and we should reflect over these matters. We should turn to God, seek His help to remove any and every kind of pride and arrogance we may harbour and which are impediments in developing humility and also play a part in spreading restlessness and discord. So that peace and accord may spread and no one endures restlessness due to us. God commands: ‘And worship Allah and associate naught with Him, and show kindness to parents, and to kindred, and orphans, and the needy, and to the neighbour that is a kinsman and the neighbour that is a stranger, and the companion by your side, and the wayfarer, and those whom your right hands possess. Surely, Allah loves not the proud and the boastful,’ (4:37). Here, after drawing attention to worship and avoiding associating partners with Him, God has drawn attention to other matters. Likewise Ramadan also draws attention towards rights of society and one may adopt them during this month on a permanent basis. If these rights are not discharged worship alone cannot attain all the objectives of Ramadan. Indeed, worship of God is an objective of this month which should be practiced and made permanent for the rest of the year. Similarly rights of mankind are also discharged in this month and should be made permanent for the rest of the year. During Ramadan the generosity of the Holy Prophet (peace and blessings of Allah be on him) towards the needy used to increase intensely and has been liken to fierce wind. His generosity during rest of the year was also peerless; therefore to liken its intensity during Ramadan to fierce wind is because there is could be no other apt analogy. Having spoken of worship of God, the aforementioned verse (4:37)addresses true worshippers of God and servants of the Gracious God and draws their attention to rights of mankind. Unless both rights of God and rights of mankind are fulfilled one cannot be a true believer, rather one is arrogant. Fulfilling these rights is not something lofty but is the obligation of every true believer and fulfilling these rights alone lead to one’s prayers gaining acceptance. These are rights of parents, relatives, the needy, neighbours, travellers, other acquaintances and those who are under our care. Thus one verse draws attention to and commands the rights of entire humanity. The Holy Qur’an mentions rights of parents elsewhere as well. It is the duty of children and not a favour. There are also rights of relatives; if husband and wife fulfil the dues of their respective in-laws as God commands to fulfil rights of close familial ties (rehmi rishtay) many disputes and disagreements would be resolved. Special attention should be given to this matter during these days of Ramadan. Care of orphans and to make them a useful part of society is a most important obligation. The Holy Prophet (peace and blessing of Allah be on him) said one who cares for orphan will be alongside me in Paradise. The Jama’at has an established system for the care of orphans. Then there are the rights of the needy, meeting all their necessities and Jama’at has separate, specific funds in this regard. The well-off should give to these funds. Then there are rights of relatives and neighbours; neighbours living in one’s vicinity as well as neighbours with whom one has ties, also neighbours whom we do not know very well and neighbours who are needy but with whom one is not on good terms. Thus it’s a complete teaching of conciliation and peace. Then there are rights of close friends, companions and travellers. These words override rights of husband and wife over each other and also encompass rights of friends, associates and co-workers. Attention is also drawn to rights of those under our care and then it is stated that whosoever does not abide by this is arrogant and this is disliked by God. Thus is the beautiful teaching of Islam for every section of society. During Ramadan God grants to those who fulfil His rights as well as the rights of mankind. We should focus on this most humbly. The special atmosphere of Ramadan draws attention to worship and other pious works and we should garner maximum benefit from them. He said at another juncture that anyone wishing to have longevity of life should propagate pious deeds and be of benefit to God’s creation. May God enable us to worship Him as well as fulfil the rights of mankind and may we all truly become servants of the Gracious God. Hadayat Bibi Sahiba, wife of a dervish of Qadian who passed away on 4 June after a brief illness. She was a moosia. Maulawi Muhammad Ahmad Saqib Sahib passed away on 18 May at the age of 98. He dedicated/devoted his life in 1939 and served the Jama’at in a long, distinguished service. He was a moosi.